My dad was drafted for Vietnam. He never went in-country, but he did train to head over there. I'm sure many of you have relatives (or possibly you, yourselves) fought in the conflict. But as hellish as that war was, at least there weren't werewolves stalking the jungles. Unfortunately, such is not the case in Full Moon Jacket, a new cooperative board game that's up on Kickstarter. Will your squad reach their goals and make it back to base? Or will they be dog chow? 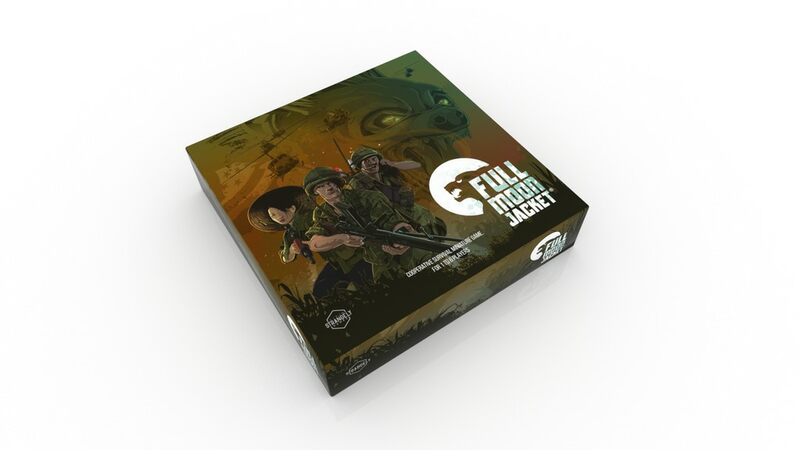 Full Moon Jacket is a fast paced co-operative squad based miniature game that is easy to pick up and play for new players and provides tactical depth for seasoned war game veterans. Your goal as elite soldiers is to locate, defend and extract the Colonel. Use your unique abilities and signature equipment to find bigger more powerful weapons, set traps and craft items to survive the night as endless Werewolves spawn throughout the Vietnam Jungle. Each game is unique, with reversible modular boards, random supply drops, werewolf spawns and the location of the colonel changing every game. As a team you must work to change and adapt your plans and tactics to achieve your objective. The campaign's around 1/4 of the way to their goal, but there's still 29 days on the clock.